What is the NF-κB pathway? NF-κB (nuclear factor kappa light chain enhancer of activated B cells) is a family of highly conserved transcription factors that regulate many important cellular behaviours, in particular, inflammatory responses, cellular growth and apoptosis . NF-κB is also involved in diseases such as cancer, arthritis and asthma (reviewed in ). Schematic representation of the canonical NF-kB activation pathway. Figure adapted from PMID: 17119127. NF-κB is formed through the homo- or hetero-dimerization of members of the Rel family of DNA binding proteins. In mammals these include RelA (p65), c-rel, RelB, p105 (the precursor of p50), and p100 (the precursor of p52). Each member of this family contains a Rel homology domain (RHD), which itself consists of a DNA binding region, a dimerization region and a nuclear localization signal. NF-κB activity is regulated by family of proteins known as IκBs which include IκBα, IκBβ, IκBγ, IκBε and Bcl-3. When in their inactivated state, NF-κB complexes are localized in the cytoplasm, in complex with IκB kinase-α (IKKα), IκB kinase-β (IKKβ) and IKKγ/NEMO, a non-enzymatic protein that may function as a scaffold. The IKK complex can be activated by various cytokines, inflammatory molecules and stress signals . 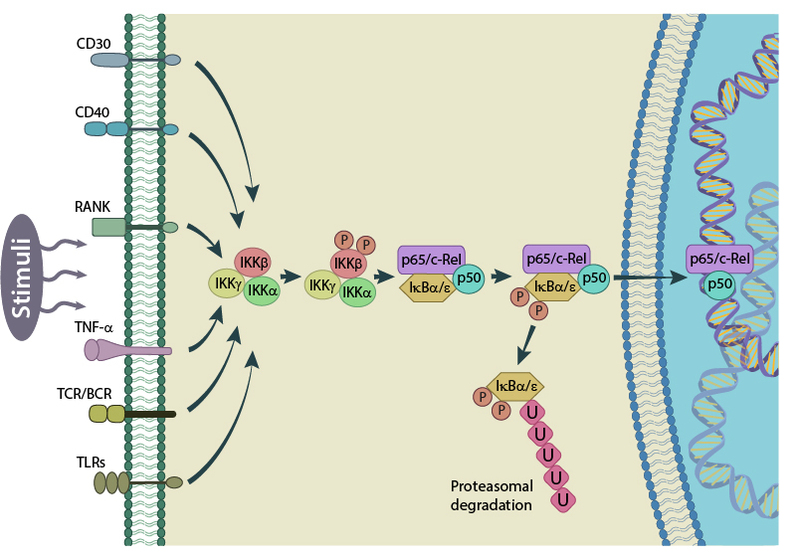 In the canonical pathway, activated IKKb phosphorylates IkB which is subsequently ubiquitinated and marked for degradation by proteases. This releases NF-κB from the IkB-containing complex and unmasks the nuclear localization signal (NLS). An NF-κB complex composed of RelA/c-Rel/p50 will then translocate to the nucleus where it can activate the transcription of its target genes . In the non-canonical pathway, p100 is degraded to p52, allowing a RelB/p52 complex to translocate from the cytoplasm to the nucleus . Depending on the composition of NF-κB in the nucleus, different genes will be actively transcribed. This variation and specificity in gene targets is further determined by the post translational modification of different subunits, such as the phosphorylation of p65. A vast range of genes are targeted by NF-κB, including that of its own inhibitor, IkB. 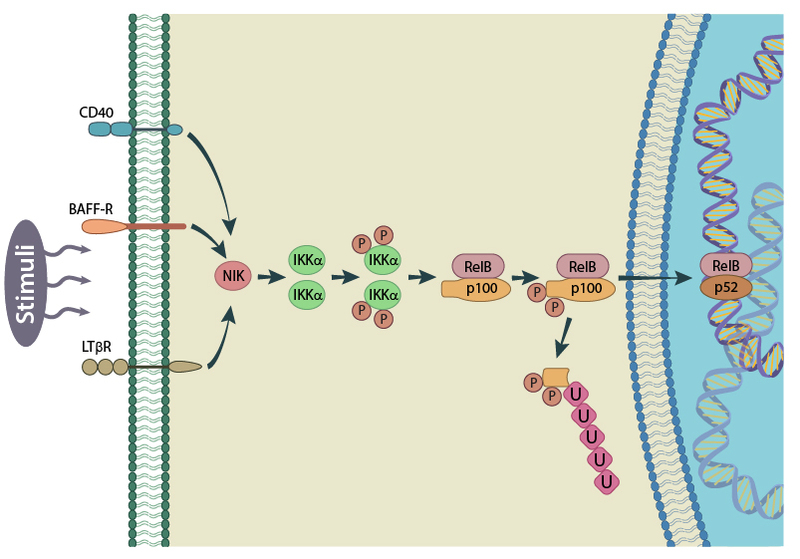 In this case, newly produced IkB will bind to the NF-κB complex and increase its localization in the cytoplasm, thus representing a negative auto regulatory feedback loop for NF-κB activity. The primary function of NF-κB is in the regulation of apoptosis. Whether the transcription factor induces an anti-apoptotic or pro-apoptotic response, is both cell-type and stimuli dependent. Whereas NF-κB predominately prevents apoptosis in B cells, and promotes B cell activation, its effect in T cells is variable, and dependent on the stimuli type . For example, glucocorticoid induced apoptosis in T-cells can be inhibited by NF-κB, whereas ionomycin mediated apoptosis requires NF-κB activation . Furthermore, NF-κB prevents the pro-inflammatory cytokine TNF-alpha, from inducing apoptosis in response to inflammation or viral-infections. Similar to its role in regulating apoptosis in white blood cells, NF-κB can either prevent apoptosis in hepatocyte, thereby enhancing liver regeneration , or induce apoptosis in the event of viral infections, such as an adenoviral infection . Interestingly, certain viruses such as HIV, EBV and Hepatitis C induce NF-κB activation to prevent apoptosis in the infected cells . Apart from its prominent role in immune response regulation, NF-κB has also been identified as a mediator of mechanotransduction in several cell types. This role is carried out through changes in both its activation, and localization, in response to mechanical signals. 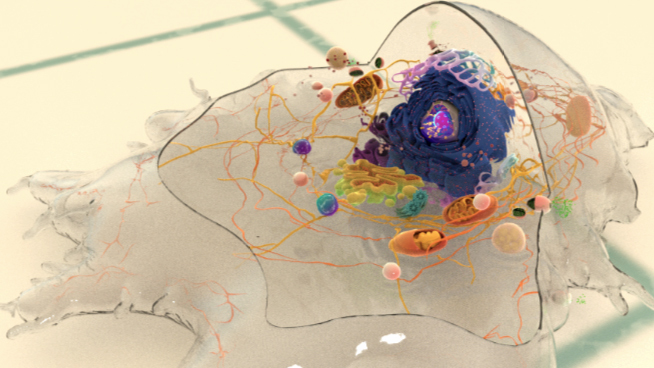 Altered cytoskeleton dynamics, for example, will activate NF-κB and this activity is crucial in cancer, where changes in the mechanical properties of the cellular environment lead not only to altered transcription profiles, but also, lamellipodia formation and enhanced cell motility. It is within this context that many supporting studies have been conducted. For example, substrate stiffness was found to regulate NF-κB activity in lung adenocarcinoma cells, with stiffer substrates promoting cell spreading . Mechanical properties such as substrate stiffness are detected by activation of integrins within focal adhesions, and the contractile activity of actomyosin fibers within the cytoskeleton. Indeed, the regulation of NF-κB activity was found to be regulated by actomyosin contractions in this case. The mechanotransduction of signals originating at focal adhesions, and culminating in the activation of NF-κB is facilitated predominately through Rho-mediated pathways. For example, activation of alpha6/beta4 integrin within focal adhesions, activates Rac1 and Cdc42, which in turn degrades IkB, leading to the activation of NF-κB . Similarly, a pathological increase in cellular motility, which can lead to malignant transformation, was linked with RhoA–ROCK-mediated activation of NF-κB . Here, disruption of endothelial cell-cell contacts was seen to initiate actin reorganization, with a subsequent activation of RhoA and PKD1 (protein kinase D1). PKD1 activation by RhoA is facilitated by SFK (Src family kinases) and nPKC (novel PKC enzymes) activation. Active PKD1 promoted NF-κB activity and although the specific genes targeted by NF-κB in this example were unknown, the authors indicated that epithelial tumorogenesis was the ultimate result . 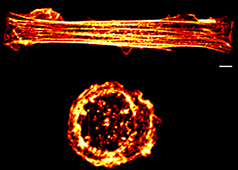 Changes in the formation or disassembly of actin filaments and microtubules will also impact the localization of NF-κB. In particular, the nuclear localization of activated NF-κB is correlated with cytoskeleton dynamics and is dependent on microtubule based motor protein, dynein . As the turnover of microtubules , and organization of actin filaments, is reduced, the translocation of NF-κB to the nucleus is increased. An increase in the translocation of activated NF-κB to the nucleus has been observed in a number of cell types when mechanical stresses are placed on the cell. For example, in vascular endothelial cells  and osteoblasts , NF-κB was shown to translocate from the cytoplasm to the nucleus in response to fluid shear stress. Similar examples include nuclear translocation of NF-κB in chondrocytes under magnitude-dependent compressive strain as well as in cultured osteoblasts, subjected to oscillatory (i.e., non-continuous) fluid flow . In the latter case, the authors also showed the involvement of focal adhesion kinase (FAK) upstream of NF-κB . Interestingly, FAK was not required for TNF-α induced activation of IKK, thus emphasizing the role of FAK in mechanical, rather than inflammatory, activation of NF-κB pathway. 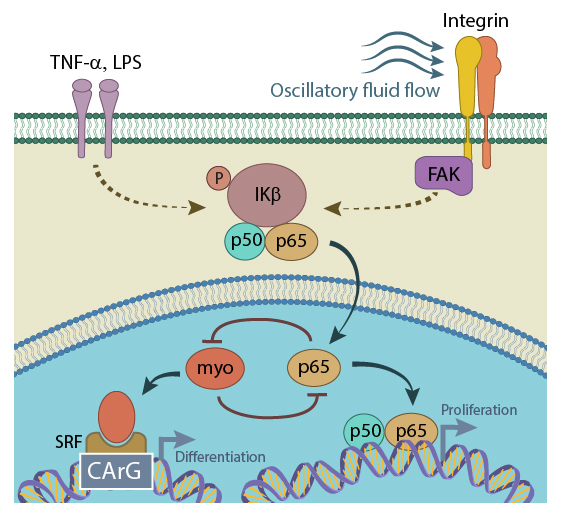 Activated NF-kB (p65) translocates from the cytoplasm to the nucleus, where it physically binds to myocardin, preventing the formation of myocardin/SRF/CArG ternary complex, and thus inhibiting SRF-regulated gene expression. This repression ultimately results in increased cell proliferation. On the other hand, when present in sufficient concentrations, myocardin can block NF-kB binding to its (NF-kB’s) specific DNA element, attenuating or even abolishing TNF-α expression in LPS-stimulated cells (figure adapted from[PMID: 18296632]). NF-κB is also linked to other mechanosensitive signaling pathways. In particular, cross talk between the NF-κB pathway and the SRF pathway was demonstrated by Tang et al  (Fig.5). In this work, conducted on cardiac and smooth muscle cells, NF-κB was described as a repressor of myocardin/SRF-mediated gene expression. Here, activated NF-κB moved from the cytoplasm to the nucleus, where it interacted with myocardin, preventing the formation of myocardin/SRF/CArG ternary complex, and thus inhibiting SRF-regulated gene expression. This repression ultimately resulted in increased cell proliferation, in agreement with findings that inactivation of myocardin is associated with malignant tumor growth . Importantly, mycardin can regulate NF-κB activity as well. This occurs when myocardin blocks NF-κBs binding to specific DNA elements and was shown to attenuate, or even abolish, TNF-α expression in LPS-stimulated cells. This results in decreased cell proliferation and therefore suggests that myocardin and NF-κB play antagonistic roles in cell-cycle regulation. Overall, it is clear that cytoskeleton organization and the physical properties of the cell microenvironment can modulate the activity and localization of NF-κB.